*The process begins with planning what materials are required, when they are required, and the price that the company can afford to pay for them. *Then the company prepares a list of vendors that they think can provide the materials for them. *Once a vendor has been chosen, the buyers create a purchase requisition form that includes information such as the description of goods and services, department account number, signatures of the authorized managers, delivery instructions and quotation from the authorized vendor. *A formal purchase order is sent to the vendor to supply the goods along with instructions as to the conditions under which they have to be supplied.
. Once the company receives the goods from the supplier, the purchase department prepares a Goods Receipt. This is an important document which can later be used for reconciling if what the seller delivered was indeed what they asked for. *The Goods Receipt is compared with the Purchase Order to validate if the two match. If there are any discrepancies, the buyer can contact the seller and post a complaint. Checks are made if the goods are suitable for use or not, if the correct quantity has been delivered, if all the goods meet the ordered specifications, and they are priced according to the terms of the purchase order. If any goods are damaged then the buyers will have to contact the sellers and ask either for a replacement or a refund. *Once the verification of the goods is done, the payment invoice is created and the necessary approvals from the project managers are obtained.When the company makes the final payments to the vendor, the cycle comes to a close. What are the benefits of procure-to-pay business process? The most obvious benefit is that a procure-to-pay process can bring light to inefficiencies and gives businesses the ability to proactively manage suppliers. For organizations, this means employees can easily and quickly buy all the goods and services need from preferred contracts, ensures they stay within budget and work with required approvals. Manual labor involving fixing invoicing issues caused by suppliers or missing orders and receipts are more easily resolved. Procure to Pay has considerable impact on the business since the process is spread across so many departments that encompass purchase, production and accounting. ·There are many checks and balances put in place, and the authorizations of numerous managers are required. ·There are companies that conduct these operations manually and use extensive paperwork thus facing the risk of documentation errors and delays in processing. ·In some firms there is a lack of communication and cohesiveness between the various divisions, and even among the personnel working in the same unit. The purchase department might place orders at a price beyond the budget of the finance department. Invoices might inadvertently get written for goods that were rejected. ·Orders might be placed for raw materials that the production unit does not need. ·There could be delays in the documentation travelling across the various departments causing late payments, which might harm the buyer-vendor relationship. 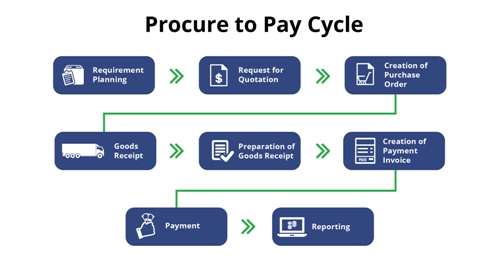 With the Procure to Pay process being fraught with the possibility of risk and inefficiency, which would have an adverse impact on the business in a competitive market, many companies are now finding ways of streamlining the procure-to-pay process.